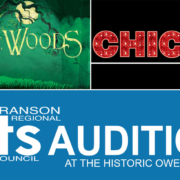 The Branson Regional Arts Council announced last week, that auditions for the 2nd major musical of the year will take place this Wednesday, Thursday and Friday (March 14-16, 2018) evening from 6pm until 9pm at the Historic Owen Theatre, 205 S. Commercial Street, Branson, MO 65616. 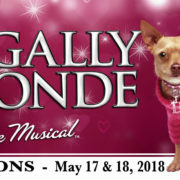 Following the completely sold out run of Annie the Musical, the bar has been set a bit higher for this production, but Show Producers Kim Hale and Lisa Murphy are up to the challenge, as well as Director Lloyd Alexander-Holt and Choreographer Kristen Dasto. 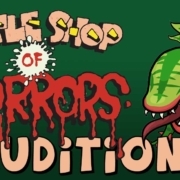 Casting auditions are open to actors, singers, and dancers ages 15+, sorry, there are no child roles in this production. Each performer needs to prepare a one minute, uptempo and ballad vocal selection. They should also please bring sheet music in the appropriate key, or provide CD accompaniment tracks. No acapella singing will be allowed. 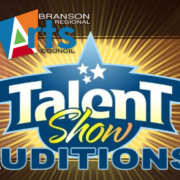 All actors should be prepared to stay for the dance call toward the later portion of the audition schedule. Dancers, please come prepared to do a jazz and a tap combination. Appropriate dance footware, ie Jazz and Tap shoes, is suggested. Ladies if you have character tap shoes, please wear them. NO BARE FEET. 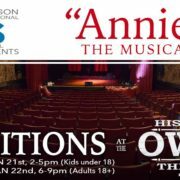 Rehearsals will be each Sunday-Thursday from 6-9pm at the Historic Owen Theatre. 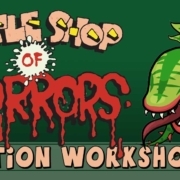 Saturday rehearsals will be held from 12pm-6pm on April 7 and April 14, Tech Week begins April 21-25. 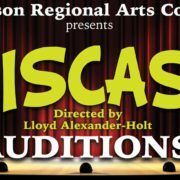 Performances are April 26, 27, 28 at 7pm, and April 28 and 29 at 2pm. no later than 9pm Central this Friday, March 16th. 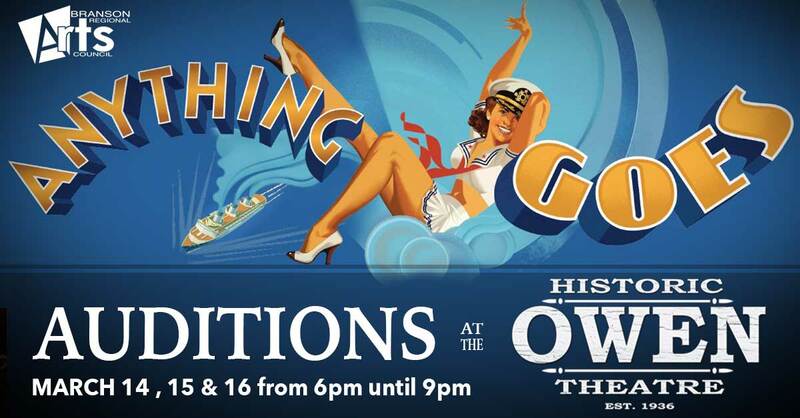 Public performances of Anything Goes will be April 26-29th at the Historic Owen Theatre in Branson. Reserved tickets are expected to go on-sale on this website before Monday, March 19th.